If you didn’t already know, I picked up a used Cobb Accessport a few months ago and installed a stage 1 tune on my Fiesta ST. Compared to stock, the Cobb tune was fantastic and greatly improved the driving experience of an already very fun-to-drive car. With such high levels of boost (around 20psi peak) and living in a hot climate, the Cobb tune was starting to feel a little lack-luster, plus detonation was beginning to worry me, as I still have a stock intercooler. For this reason, I switched from 91 octane to E30 fuel, and with that switch, I now run a Stratified Auto tune. What’s The Point of E30? Before I give you my thoughts about my new tune, I wanted to quickly cover what E30 is and why you want to run it in your Ford Ecoboost engine. Ethanol is an alcohol fuel, that is distilled from plant materials such as corn or sugar; this is why you often hear it referred to as “corn juice” or “corn fuel.” Ethanol that is available from a fuel pump is almost always mixed with gasoline for various reasons. The most common mixture is “E85” which is 85% ethanol and 15% gasoline. A mixture like E85 generally has an octane rating ranging from 94 to 110, which is much better than the 91 or 93 octane fuel you’ll find in most gas pumps. With a higher octane rating, you can run higher levels of boost and more ignition timing without running into detonation. If you didn’t already know, detonation is very bad for your engine and occurs when the air/fuel mixture inside the cylinder combusts from compression and not from the spark plug. The ability to run more boost and more ignition timing is what makes it such an attractive fuel for enthusiasts with boosted cars, as it’s an easy way to get more power from your car safely. I mentioned E85 above, as it’s the most common mixture you’ll find at an ethanol pump, so why am I using E30 in my Fiesta ST? Unfortunately, ethanol is less energy dense than gasoline, meaning it requires more liquid to create the same size explosion. The decreased energy density means your fuel system must work harder to keep the air/fuel ratio where it is supposed to be. 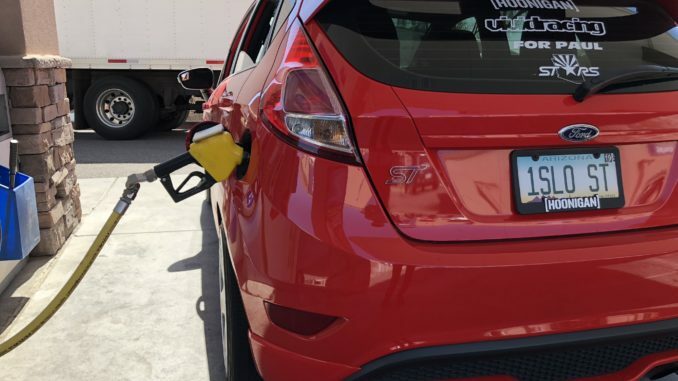 The Fiesta ST’s fuel system is designed for standard gasoline, and it’s powerful enough to flow E85. It has enough flow to run E40 on a stock Fiesta ST, but that would require pushing the fuel system quite hard. For this reason, pretty much everyone who wants to run ethanol in their Fiesta runs E30, which allows you to run more boost and ignition timing without overloading the fuel system. E30 is not available straight from the pump, which means you need to mix your fuel to create E30. Here in Arizona, our ethanol pumps are almost always E54, which means you need around a 50/50 mix between 91 octane and ethanol to create E30. It’s always a good idea to keep an ethanol tester in your car so you can verify the ethanol content before putting it in your car. The wrong mixture can be dangerous depending on how aggressive your tune is! Right off the bat, I will tell you that Cobb vs. Stratified is not nearly as large of a change as Stock vs. Cobb. When you first put a Cobb tune on your Fiesta ST, you will be surprised by the huge amount of torque it has. Top end power isn’t too much different from stock, but anything below 5,000 RPM, where your engine is most of its life, feels much better compared to stock. 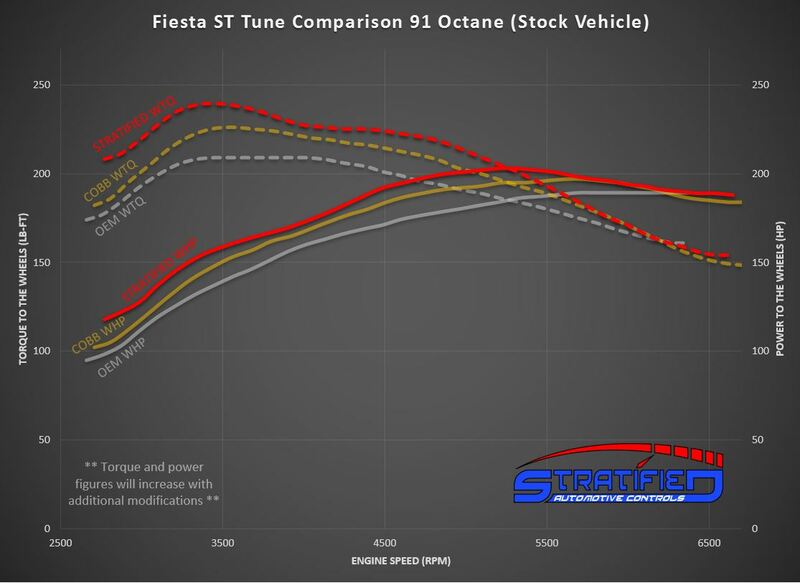 Going from the Cobb 91 tune to the Stratified 91 tune, there is more low-end torque and more top end power, but don’t expect it to blow your mind like stock to Cobb will. On the Cobb tune, I would regularly see around 20 psi of peak boost, but never anything more than that. On the Stratified 91 tune, I saw 26 psi almost right away! Moving over to the E30 tune, there is a noticeable jump in power, especially at the top end. On E30, not only are you getting more low-end torque, but you’re getting around 10whp more peak more, which makes the car noticeably faster and cars that barely beat you before would lose now (ask me how I know.) More importantly, there is less negative ignition correct, meaning the car is happier to make that kind of power. Mixing fuel at a gas pump is a little annoying, but the power gains are worth it in my opinion. Quite honestly, this E30 tune has made me second guess my idea of selling my Fiesta ST and getting a Focus RS. 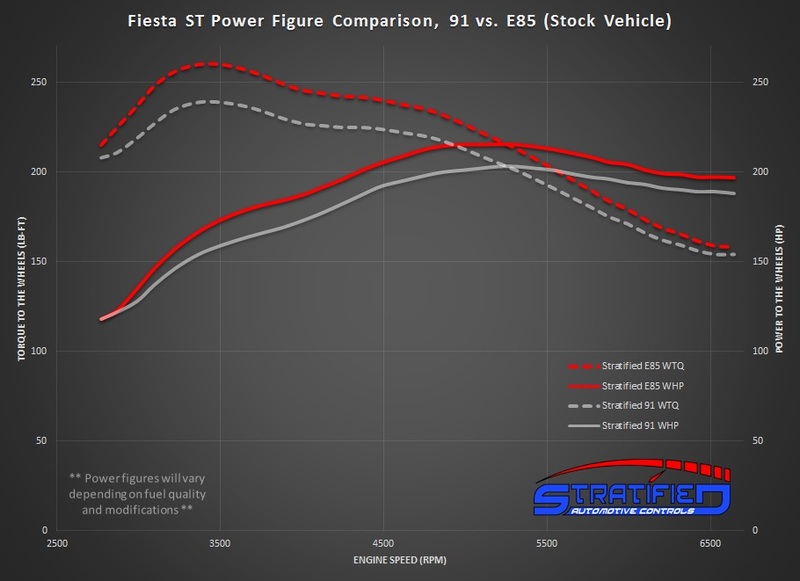 If you currently use a Cobb off-the-shelf tune with your Fiesta ST or Focus ST/RS, I recommend switching over to an E30 tune from either Stratified, JST, Tune+, or any other reputable Ecoboost tuner who offers an E30 tune. For now, I will recommend Stratified, as their turn-around time was fast and their tune is spot on. Be sure to check out our video below!